A small snippet of info about what we offer - please visit the pages on our website for more! Congratulations on your new addition to the family! If you want to help your puppy be the best dog they can be, then Puppy Preschool is for you. Beautifully mannered dogs don’t train themselves – their owners invested considerable time and effort in the formative months of their life. Puppy preschool classes are held at Swanbourne Veterinary Centre on Sunday mornings, with a course starting every two weeks. We have a dedicated team of behaviour and training experts to teach you and your puppy all they need to know. One of the most important aspects is having a fun time while at the vet! For more information and to book a place, please contact the clinic on (08) 9384 2644. At Swanbourne Veterinary Centre, we believe that early detection and prevention are the most important components to ensure that your pet lives a long, happy life. While annual vaccination boosters are not required in every case, the most important component of the annual health check is the thorough examination your best friend receives. The other important component is you – take note of any changes in weight, water intake, new lumps or anything else different you may notice. A simple observation from you may help in an early diagnosis or prevention of illness. 6 months after your annual check, we include a complimentary health check, nail clip and hydrobath carried out by one of our qualified veterinary nurses. We will send you a reminder when this is due. The primary emphasis will be on checking teeth, skin, weight, lumps or any other issues you may have noticed. If one of our nurses indicates that something may be amiss then you will be given the option of a consultation with the vet at that time. The Wellness Check is an attempt to capture anything unforeseen that may have arisen since the annual health check 6 months prior, however it is also a great opportunity to catch up on deworming, heartworm and flea control, or a growing waist line! This is just another aspect of our total commitment to preventative medicine, your best friend’s health and your peace of mind. Vaccination is essential to ensure your pet remains healthy. Many deadly diseases can be easily prevented by vaccinating your pet. This is important as often these diseases can be fatal even with treatment. Our vaccination policy is in line with the World Small Animal Veterinary Association’s recommendation that every animal should be immunised, but that dogs no longer need to be vaccinated against all diseases every year. We are reducing the number of vaccines we give to our patients where possible. Your pet’s vaccination protocol depends on their lifestyle, their previous vaccinations and their health status. If you are unsure if your pet is adequately protected, there is also the option of Titre Testing for some of these diseases. This assesses your pet’s antibody levels against certain diseases, and can give us information about when booster vaccinations are required. 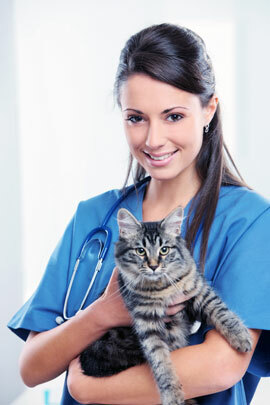 Please feel free to speak with one of our veterinarians if you have any questions about our vaccination policy. A microchip is a unique identifier for your pet, with a number that is linked your contact details on a national database. This allows your pet to be quickly and easily identified in case they are lost or injured. Microchips are used in a wide variety of animals including dogs, cats, birds, horses, wildlife & fish! Microchipping is very safe for young and old animals. Microchipping is a quick and simple procedure, it only takes a few minutes for one of our veterinarians to inject the microchip under your pet’s skin (similarly to a vaccination). We will link your contact details with your pet’s microchip on a national registry. We can now register your pet’s microchip online and receive confirmation immediately! Microchipping is now compulsory for all cats and dogs in Western Australia. We can always check for a microchip if you are concerned your pet may not have one. The cost is inclusive of the implant, implantation and lifelong registration. Please contact the clinic on (08) 9384 2644 to ask about microchipping. Desexing or neutering refers to the surgical procedure to remove the reproductive organs of either a male (castration) or female (spey/ovariohysterectomy) animal. We recommend desexing your pet between 5-6 months, however they are never too old to be desexed. If you have any concerns before or after your pet has been desexed, or alternatively to book your pet’s surgery, please call us on (08) 9384 2644. Dental disease causes bad breath (halitosis) and pain, and it can also be a source of infection throughout the body. Dental disease may affect 70% of cats and 85% of dogs over three years of age. Symptoms may include bad breath, inappetence, weight loss, oral discomfort or lethargy. Some factors that influence dental disease include age, breed, diet, tooth alignment, chewing behaviour, and home care. There are many things you can do at home to keep your pet’s teeth healthy for as long as possible, and these should be started while they are puppies and kittens. However, adult cats and dogs frequently require a dental treatment with a scale and polish under general anaesthesia to keep their mouth healthy. Even humans that brush twice daily require a visit to the dentist every 6-12 months for a scale & polish! Plaque builds up in the mouth, which then causes gum inflammation (gingivitis). Once the gums are inflamed, we start to see gum recession and root exposure. This is a painful condition itself, however it can lead to tooth root abscesses which are exceptionally painful. If there is gum recession or root exposure teeth may need removing, as they will continue to cause pain and infection. A dental procedure will allow us to start their dental care with a clean mouth, and we can help you to prevent or slow dental disease in the future. We wash dogs seven days a week at Swanbourne. We have experienced staff who are available to do this, and it includes a brisk towel-down. We can use a nice smelling shampoo, or a medicated shampoo if needed. There is also a DIY service available for those who don’t mind getting wet themselves! We have two groomers that together provide a wonderful service in the clinic. Shai-Marie & Annie both do an excellent job and are extremely popular. So if your pooch is in need of a new hair cut, hair style, wash and blowdry, or just a winter trim, please call us to arrange a grooming appointment on (08) 9384 2644 – we do book out very fast! Our registered veterinary nurses and vets can also trim your dog or cat’s nails in a stress free environment. For more information or to make a booking, please contact the clinic on (08) 9384 2644. Going on holidays soon? We are happy to help you organise your pet’s care. A new addition to the services provided by Swanbourne, we can now offer you the option of purchasing your products online, and shipping them straight to your door.